Having a gathering and need a yummy breakfast? Here’s a great idea. The hollandaise sauce is made in one pan. Easy peasy! Prepare a 9 x 13-inch glass baking dish with nonstick cooking spray. Mix torn muffins and Canadian bacon and put in the greased baking dish. Mix all remaining ingredients together and pour over muffins and bacon. Let sit for 30 min and bake in the oven at 350˚F degrees uncovered for 40 minutes. 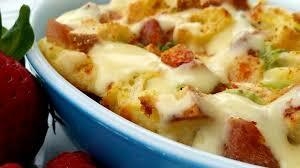 Remove cooked casserole from oven and pour hollandaise over. Garnish with diced tomato and roasted asparagus spears cut into pieces. Serve immediately. Place all ingredients together all at once in a nonreactive saucepot and set over low flame, stirring continuously with a whisk until all ingredients are melted together. Continue to cook, whisking regularly, till the sauce is nice and thick. Do not walk away and do not let it overheat or it will break; go low and slow.